Chris Trzcinski loves to hike, and the 15-year-old from Southern California wants to share his hiking information with other people. So he created his own Web site: www.greatwheelchairaccessiblehikes.com. While many others turn to their own two feet to power them down a hiking trail, Trzcinski, who has cerebral palsy, depends on his wheelchair and the assistance of his parents, Dave and Heather. 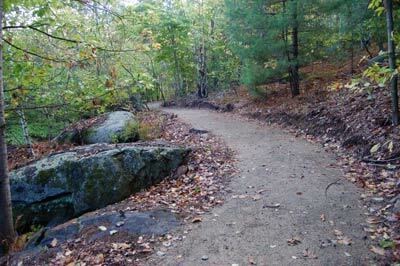 And while state park and travel Web sites list several wheelchair-accessible hiking trails, the reality is that not all the trails are maintained properly or are as wheelchair-friendly as they appear. Off of Crotched Mountain Road across from the main campus of Crotched Mountain Rehabilitation Center, a sign marks a side road as restricted access. Beyond the sign, universal hiking trail builder Peter Jensen and his crew are working to make the area accessible to absolutely everyone. The Limberlost Trail, at milepost 43, is different from many trails along the drive. It’s an ADA accessible trail (meaning a wheelchair can travel on it) with a crushed green walkway and only a slight grade. The circuit hike of 1.3 miles is good for any age. The trail passes through forest and mountain laurel and crosses over several long wooden walkways. Trekkers who visit Greenleaf Hut, perched below the mile-high summit of Mount Lafayette in New Hampshire’s White Mountains, must make their way up a relentlessly steep, rocky, rutted and rooted trail, often buffeted by ferocious winds and numbed by sub-freezing temperatures, even in summer. So when the Appalachian Mountain Club decided to renovate the 1929 building a few years ago and make it handicapped-accessible, most people reacted the way Sarah Palin claimed she did to plans for Alaska’s notorious “Bridge to Nowhere.”? When the trail opens next year, I hope you’ll come to try it out and tell all your friends. Thanks for the post. through adaquate repair and maintenance. The UTAP (Universal Trails Assessment Process) is a tool for measuring the accessibiltiy of trails, and seems to offer a way for people with disabilities to improve trails by evaluating ‘accessibility’. If we could get something going to have people with disabilities evaluate which and what needs to be done – we could better many peoples recrteational opportunities. Randy and I (Co-chairs of Wheels On Trails) will attend the NTS (National Trails Symposium) in November to promote the access issues. Randy has CP and I have a heart problem, but we wtill have completed a $10,000 evaluation of 11 trails in duluth, and also have a $10,000 DNR grant to fix them. It’s good to know that there are still individuals who make way for everyone to enjoy and access the outdoors.. It really is a good way of encouragement for those who need it the most..
My name is Brian Green and I own Specialized Mobility LLC. here in Birmingham, Alabama. A little background on who we are and what we do…In 2004 my Mom and Stepfather retired and moved to Gulf Shores. 2005 my Stepfather found out he had ALS or Lou Gehrig’s Disease. With his strength dwindling he needed a way to access the beach. He came up with a beach wheelchair. Not just any ordinary beach chair, but one that is powered. So with this he began research and development for a better chair. After starting with PVC, then Steel, he finally settled on Aluminum for the frame. Forward to today, 8 years later, he and my mother own a company that rents these chairs to those with disabilities at the beach. Currently they have 20 chairs that they rent. Over time my Sister and I had always talked about a trail chair or a hunting chair for those who don’t go to the beach. Well as of July 2012 my Brother-in-law started Global Extreme Mobility, a manufacturing company for such chairs. As of November 30, 2012 I started my company to market these chairs for Global Extreme. I think we have a product that would benefit your park/trails to help expand it’s accessibility to those with disabilities. Our chairs are quiet, electric powered and require almost no maintenance. Attached are some links to our Youtube videos of our Trail chair known as the “Nomad” and also our Extreme Chair “The Hunt”. I would love to hear your thoughts on what we have and discuss with you how they could help make parks more accessible. Take a look at what we have and give us a call.